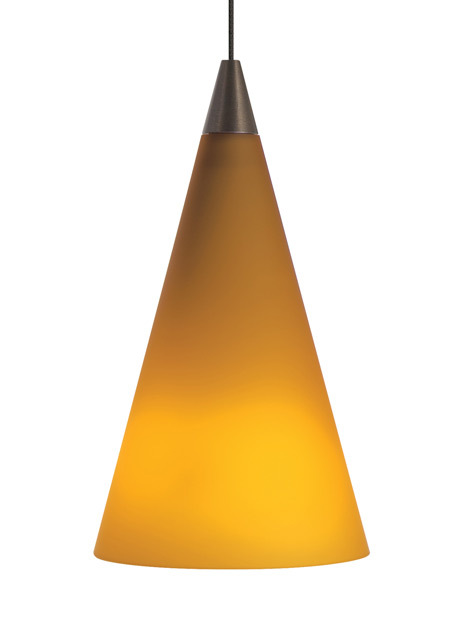 The Cone pendant light by Tech Lighting is simple and modern in design yet visually striking due to its bold colors. This simplistic cone is made of case glass and features a reflective white interior, helping to distribute lighting onto surfaces below. Customize the Cone pendant by selecting from four electrifying colors. Amber, Cobalt and White. With a modest size, scaling at 6.5” in length and 3.9” in diameter, the Cone is ideal for kitchen island task lighting, bedroom lighting flaking an end table or hallway lighting. The Cone Pendant ships with your choice of fully dimmable halogen or LED lamping, saving you both time and money. Pair the Cone pendant with the Monorail system by Tech Lighting for greater design customization. Includes low-voltage, 50 watt halogen bi-pin lamp or 8 watt, 300 delivered lumen, 3000K, replaceable SORAA® LED module and six feet of field-cuttable cable. Dimmable with low-voltage electronic or magnetic dimmer (based on transformer).